In cold climates that get snow and ice in the wintertime, the roofs on family homes and garages can suffer from ice dams. 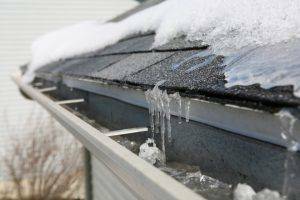 These glacial layers of ice can do quite a bit of damage to roofs, walls, and gutter structures that is difficult and costly to fix. The best way to deal with ice dams is to prevent them from forming in the first place. Use the following tips to protect your property all winter long. If you notice any of these things after bouts of cold, wet weather, you probably have a problem with ice dams. 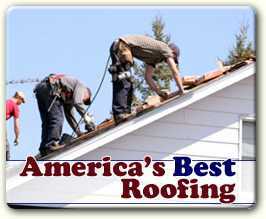 When snow, freezing rain, sleet, or ice falls on your roof, it can either slide off or sit there building up layers. These layers solidify and sit on the roof like an unmovable glacier putting pressure on the shingles, gutters, and everything else up there. As it slowly melts, the ice forms a type of wall or dam over the gutter and the meltwater pools behind and under it. If possible, remove snow and ice from the roof when it forms. However, standing on a ladder in a snow storm and scraping a shovel or broom around is not recommended. Climbing onto your roof without safety gear after the snow falls can result in horrendous injury too. There are heated cables that plug in to any outdoor outlet. You can install them easily near the edge of the roof and turn them on to prevent ice dam formation during cold, wet weather. Other options to help prevent ice dams include installing a smooth metal roof the snow or ice can easily slide off of. 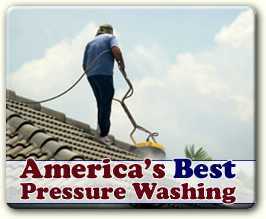 Unless this is a frequent problem, most homeowners would not want to go through the expense. Best to deal with them when they happen instead. Break up the ice dam physically. Do not use an axe or spiked apparatus that could break your roof. Work carefully to chop the ice into chunks so the water can escape. Use calcium chloride ice melt – never salt – to melt troughs in the ice dam. It is not necessary to remove the entire thing at once. If there are channels for the water to flow through, the roof will stay safe. Keep downspouts clear of ice chunks. Part of the reason dams form and water backs up under the roof is that the gutters are clogged and water cannot flow.